Rinse the meat and pat it dry. This removes any debris from packaging or handling. Core the cleaned apples and cut in 1/2-inch rings. Preheat both frying pans on low heat. Gather, measure, and prepare ingredients. Turn the heat up under one of the frying pans to medium-high, and add 4 ounces of butter. 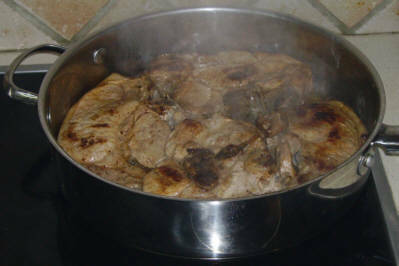 As soon as the butter stops frothing and starts to turn a pale brown, add the pork chops and brown well on both sides. Start the next step while the pork chops are browning. 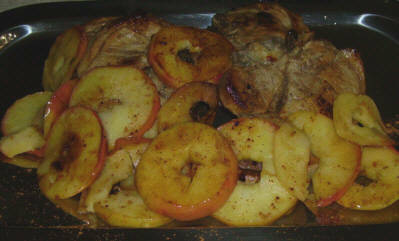 While the pork chops are browning, use the remaining 2 ounces of butter for the apples. Add the butter to the second preheated frying pan, and turn the heat up to medium. 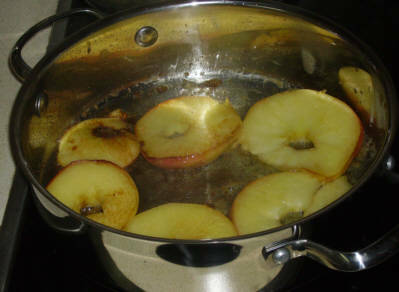 As soon as the butter stops frothing, sauté the apple rings until golden brown. They will brown very quickly. Use a spatula to turn. 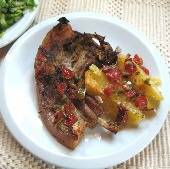 As soon as the pork chops are browned – about 2 1/2 minutes per side – while the apples are still being sautéd, add the wine to the meat and reduce heat to low. Note: It is unlikely that all the apple rings will fit in the frying pan at the same time, so divide the butter appropriately. Have a plate ready to hold the cooked apples until all the rings are done. Sauteeing the apple rings begins while the pork chops are browning. Using a spatula, carefully place the apple rings on top of the pork chops. Simmer together for 5 minutes. 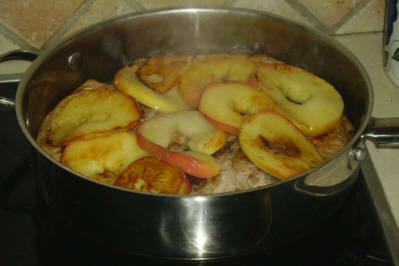 Add the apple rings to the browned pork chops. 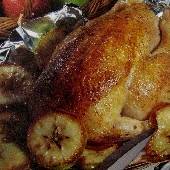 Serve on a platter or individual plates, spooned over with sauce. Add a sprinkle of cinnamon, and you’re done! Tip: Seasoning is individual, so you may want to let each person add salt and pepper to taste. Beautiful and tasty. Kali Orexi (Enjoy)!